SCEE has confirmed that PlayStation 3 Firmware v3.15 will be available to download soon. Firmware 3.15 will be an optional update with two key features: PS3 Data Transfer and PSP Minis Compatibility. The firmware update will also fix the BlueTooth Controller pairing issue experienced by some users. See below for more details on the PS3 Data Transfer feature and PSP Minis Compatibility. 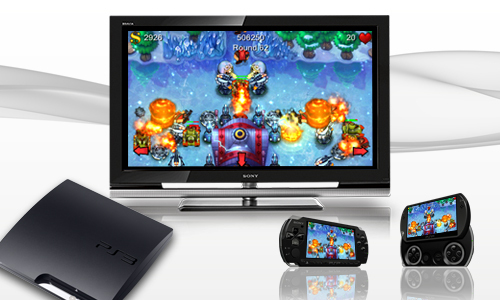 PSP Minis were launched back in October, but from the 17th December you will be able to enjoy these bite size games on your PS3 as well as your PSP. This firmware update allows the minis emulator to work on PS3 and Sony are working on getting the majority of the current minis ready for the PS3 from the 17th December. If you buy a minis game from the 17th it will work on both platforms so if you have a PS3 and a PSP you will only need to buy it once and it will be available to download to your PS3 and your PSP. If you have already bought a mini for PSP and want to get it on your PS3 as well, just go to your download list in the Store and download it again for free. The game will then work on your PS3 as well. Simple! This feature enables you to easily transfer all of your saved data from one PS3 to another. So if you decide to get a new PS3 you can make sure you don’t loose any of your existing content. Content such as games, game save data, and videos downloaded from PlayStation Network can be transferred to the new PS3 system and deleted from the current PS3. Other content, including personal media files (photos, music, videos), can be copied onto the new PS3 and remain on the current PS3 system. the data can be transfered , i just wish i can copy the demos in some way to share them with my friends , but yet again if i have to do it , i gotta turn on my account on their ps3 , PS : DANTE’s INferno demo IS AWESOME !